The Scene Inside Circuit City: "Close to Pandemonium"
"Consumers seemingly snapping up anything that wasn't nailed down. (I've never seen so many HP wide-screen monitors in one checkout line)," according to CNET. The lines? Almost as long as Fry's - for once. • "The store that I visited on Saturday had been taken over lock, stock, and barrel by the liquidator." 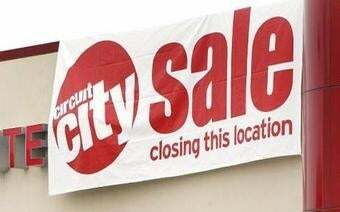 The store manager said she answered to the liquidation company now, not anyone from Circuit City. • "Consumers swarming everywhere: every one of them with at least a few breathless questions and scant employees to provide answers." • "One male employee in the section I was browsing, spent most of the time I was there (about 15 minutes) pleading ignorance and searching for a manager who never (apparently) materialized." Anyone been out to their local Circuit City? I hear the deals they're offering aren't as awesome as you might expect from a liquidation. That and, frankly, the fact they're getting rid of everything a month after everyone blew out their credit cards on Christmas makes me wonder just what they'll manage to get out of this. But people are showing up to pick over the bones at least.